Attending the 7th edition of Fashionclash -which took place in Maastricht last month- was truly inspiring. What makes the festival so special is its unique blend of fashion, art and performance, gathering creative minds from all around the world under one single roof. Founded by Branko Popovic, Laurens Hamacher and Nawie Kuiper, Fashionclash stretches over a period of 3 days, offering an open and dynamic platform to new talent, underlining flair and creativity. 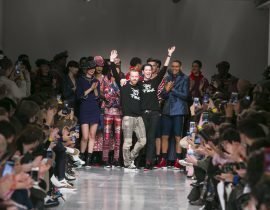 Growing stronger and becoming more focused each year, the festival introduced prizes for the first time, with LAT scooping the Fashionclash Festival Award 2015 and an enviable 5000€. Designed by Lautaro Amadeo Tambutto, who is from Argentina but now based in Milan, LAT managed to approach folklore elements in a fresh and seductive way, fusing sartorial traditions with the comfort of sportswear. The Portuguese designer Patrick de Padua walked away with the Kaltblut Magazine Award 2015, which will help increase the visibility of his brand. Focusing on strong and unfussy menswear styles, his collection had an urban and progressive vibe, including reworked outerwear staples and playful accessories, as well as sharp jackets and baggy pants. I loved Yojiro Kake's collection, whose bizarre and beautifully made garments brought Japanese fairy tales and girlish fantasies to mind, hovering between the cute and the absurd. 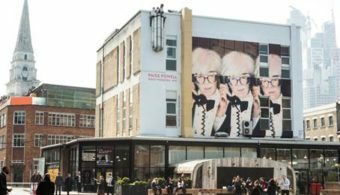 Fashionclash has stuck to its guns throughout the years and not lost any of its integrity as a forward-thinking fashion event. The founders of the festival honestly believe in supporting and nurturing others, a message that nicely came across during this 7th edition. Next year, the festival will go mobile and surprize its fans with new destinations and unexpected locations. This is What Made in France looks like…ASVOFF trophies created by Miguel Villalobos in collaboration with Designer Philippe Guyot from Brand Alain Mikli (Luxottica).